IFLA representatives are currently in Geneva at the World Intellectual Property Organisation (WIPO). They will take part in week of international discussions about copyright, alongside representatives of many of the United Nations Member States. There will be a particular focus on exceptions and limitations to copyright for libraries. This, the 37th meeting of WIPO’s Standing Committee on Copyright and Related Rights (SCCR), will offer an important opportunity to shape actions planned around exceptions and limitations. After talks about broadcasting on the first two days of the meeting, Wednesday 28 November is likely to be the day where they focus on libraries. Member states are exploring what our institutions need to do their jobs, and how to move forwards. We expect to hear Member States take positions on the topic, as well as receive presentations by renowned scholars to illustrate the issues. You can follow the discussion live here: http://www.wipo.int/webcasting/en/. We published a call for action ahead of the meeting, but more can be done now: let your government representatives know that their citizens, and the libraries that serve them, care about the outcomes of the discussions. Ask them to support progress at the international level. 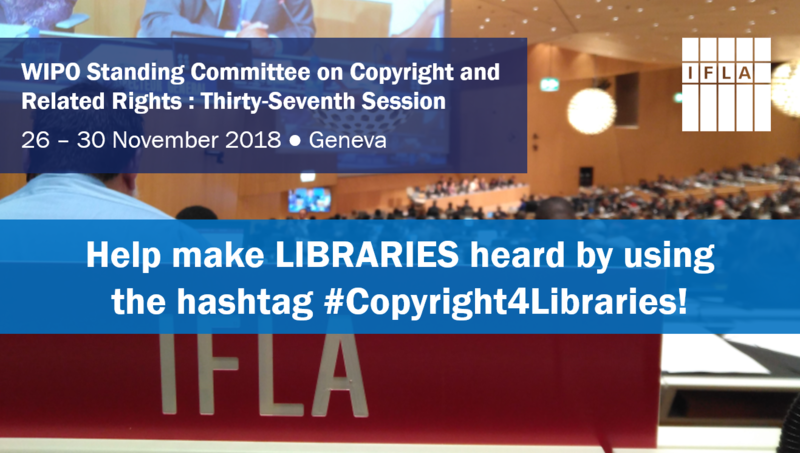 Post on social media using the hashtag #Copyright4Libraries. Here’s an overview of positive things that WIPO member states said about libraries at the last meeting. For a clear idea of what can come out of SCCR, it is the body that adopted the Marrakesh Treaty. This international instrument is proving to be very successful and it has been ratified faster than any other treaty in WIPO’s history. Nigeria will have elections in 2019. A presidential candidate promised to protect the intellectual property works of Nigerians better. This article provided me with the information to Tweet at the presidential candidate to get his strategy group listen in with the link provided to learn the globally accepted pathways to protect intellectual property. Thank you IFLA!! !